Every now and then, some interesting IPOs with palatable valuations pop up such as HC Surgical Specialists and Advancer Global which I wrote about previously. At the point of their respective IPOs less than a year ago, they each had respective offer prices of S$0.27 and S$0.22 per share. At the last done prices on 15 March 2017, their per share prices reached S$0.58 and S$0.36 respectively. There certainly are opportunities to profit from IPOs if they are the right business and if their valuations are compelling. This time around, the IPO in question is Kimly Limited (“Kimly”), a company that runs a chain of coffee shops and bills itself as ‘the largest traditional coffee shop operator in Singapore’. The offer document can be downloaded off Catalodge on the Singapore Exchange (“SGX”). 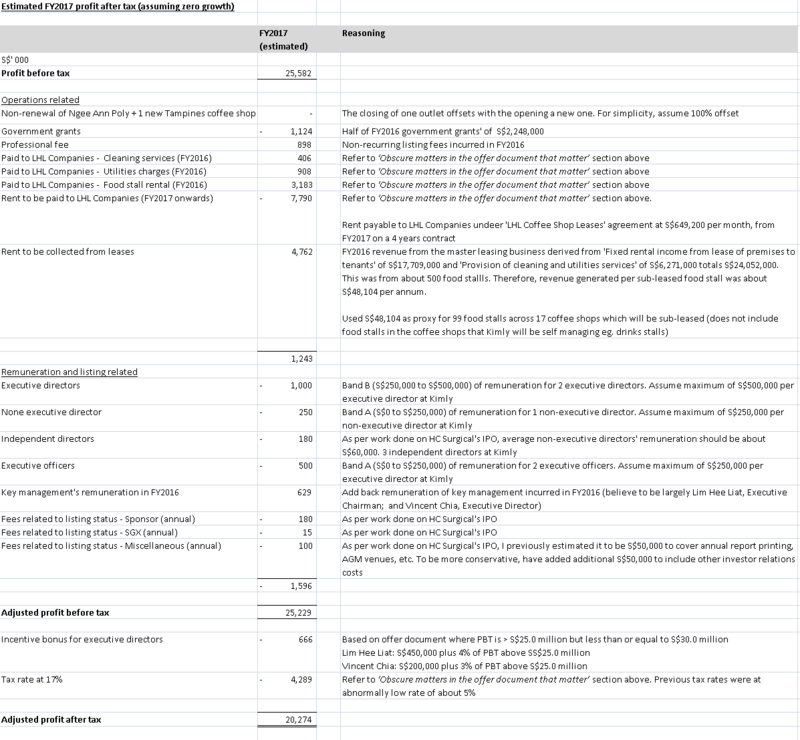 I have jotted down some points below which encapsulate the key matters of the IPO, the business, valuations, etc. For the Outlet Management Division, Kimly is the master leaseholder of the food outlets. For the segment, Kimly leases food stalls to tenants and provide cleaning services to tenants of the food stalls and charges utilities. Other than that, the segment also sees Kimly self-operating some of the most profitable parts of the food outlets, including the drinks stalls. For the Food Retail Division, it consists of Kimly self-operates the Mixed Vegetable Rice, Seafood “Zi Char”, Dim Sum and Teochew Porridge stalls at several of the food outlets that it operates and manages. 2 key qualities of the business which I like are the capex frequency and quantum. As such, I’ll spend a little more time expounding on the matters. All F&B businesses have to spend a certain amount of capex to refresh the look of their premises at some point. In that regard, the coffee shop business comes out way ahead of a typical restaurant business. Unlike restaurant businesses which have to spend a relatively large amount of capex due to the more sophisticated design and materials required to appeal to patrons in order to justify the higher prices they charge, most coffee shops do not have such problems. The design and materials are pretty basic and typically, patrons do not care much about how spanking new it is as long as the food is good and affordable. 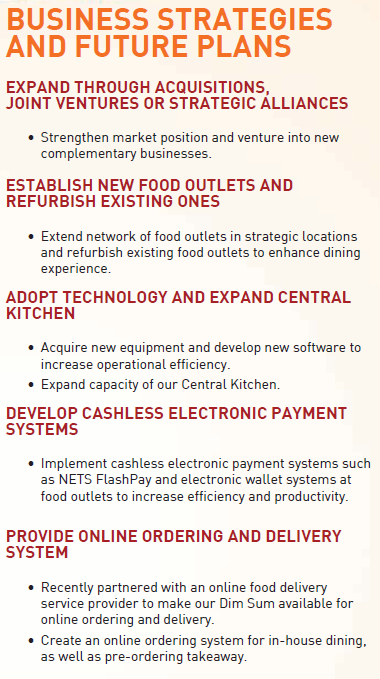 Restaurant businesses also need to update the look and feel of outlets more frequently. This means higher frequency of capex which comes probably every 3 to 5 years whereas the aesthetics of coffee shops’ typically stay the same for many more years and most look like they are about to fall apart before the operators touch them up or go for an entire revamp. One ironic observation is that the older the coffee shops’ aesthetics are, the larger the crowd is. The newer looking it is, the smaller the crowd it seems. This likely arises from older hawkers having established themselves in a particular location over many years and have earned a reputation for themselves, thus, drawing snaking queues while the coffee shops themselves continue to reflect the era when the hawkers first started out. Contrast this with the restaurant business. A shabby looking restaurant or food court in a shopping mall is almost sure to turn patrons off. Walking into an air-conditioned mall comes with expectations of spanking new facilities and a nice environment to dine in. In short, the lack of a double whammy of higher quantum and frequency of capex invariably raises the profitability of coffee shops as compared to restaurants. Interestingly, only S$3.0 million of the IPO proceeds are allocated to ‘Refurbishment and renovation of existing food outlets’, representing just 7% of total proceeds. These two statements under the ‘Trend Information’ section caught my eye as I was going through the more than 400 pages of Kimly’s offer document. That led me to relook further in the ‘Restructuring Exercise’ section of the offer document. For (a), interestingly, it really means that Kimly will be master leasing 17 outlets as part of an agreement with LHL Companies, which is essentially controlled by Lim Hee Liat, Kimly’s Executive Chairman. In other words, LHL Companies (or if you wish to see it in another way, the Executive Chairman) will be the landlord that collects rent from Kimly, the listed entity, for the 17 properties. Lest you think this interested party transaction is dodgy, it may not be the case. On K-13 to K-14 of the offer document, it appears that Kimly will be paying below market rate in rent (on average, 13.3% below market rate) to LHL Companies, with a 4 years + 4 years leasing agreement. Following the expiry of the first 4 years of the agreement, the rate will be adjusted to ‘not more than Market Rental Value and not lower than 75% of the Market Rental Value’. The 100% upper limit on the market rate of the master leases provide minority investors with a degree of comfort that the Executive Chairman will find it hard to milk Kimly through unreasonably exorbitant lease agreements. For the past financial years – FY2014 to FY 2016 – the financial figures does not include the master leasing agreements as the LHL Coffee Shop Leases agreement was only set in motion after the restructuring exercise on 1 October 2016. This also means that revenue (from rental income collected from food stall tenants) and correspondingly, costs (from master leases paid to LHL Companies) will increase, enabling Kimly generate profits from this spread. Not to mention, Kimly will likely benefit from the favourable below market rate leasing contract agreement with LHL Companies. It is also useful to note that through the years, Kimly has paid LHL Companies certain food stall rental fees (S$3.2 million), cleaning services (S$0.4 million) and utilities charges (S$0.9 million) in FY2016. While Kimly wasn’t the master lessor in FY2016, the expenses arose from Kimly’s operation of the drink stalls in all 17 outlets as well as some other individual food stalls through its Food Retail Division. These will have to be normalised in that the expenses will be part of the overall monthly master lease amount to be paid to LHL Companies. Overall, this should lead to an increase in profits. For (b), Kimly’s effective tax rate had been abnormally low at between 4.5% and 5.5% over FY2014 to FY2016. The statutory corporate tax rate in Singapore is 17%. The much lower effective tax rate then was mainly due to the large number of small entities Kimly group controlled (eg. one coffee shop under one legal entity) which, under the tax system, allowed for partial tax exemptions as long as an entity does not exceed a certain profit level). Given that the restructuring exercise would have amalgamated the entities to give rise to larger entity sizes but a lower number of overall entities, Kimly’s overall effective tax rate should rise. Consequently, this should impact profit going forward. 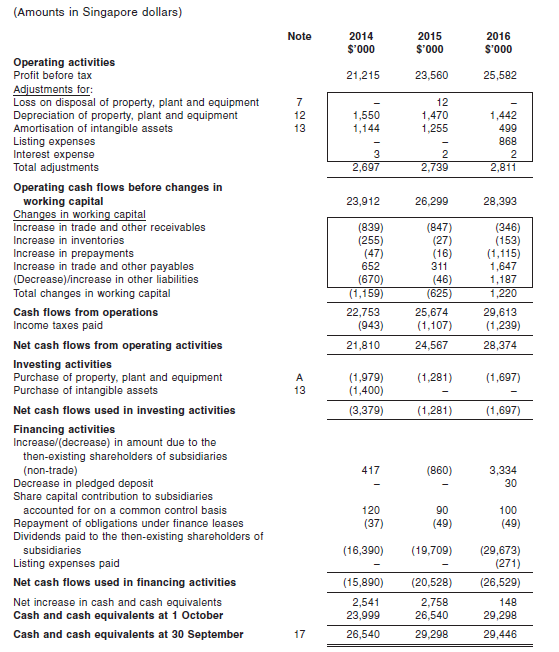 Overall, the income and cash flow statements appear to be good. In fact, it is better than good. The business is generating boat loads of operating and free cash flows. Revenue and all profitability metrics appear to grow at a good pace over the last 3 years. Considering that Kimly spent relatively small capex amounts and F&B businesses are relatively slow growth, the set of numbers definitely look favourable. 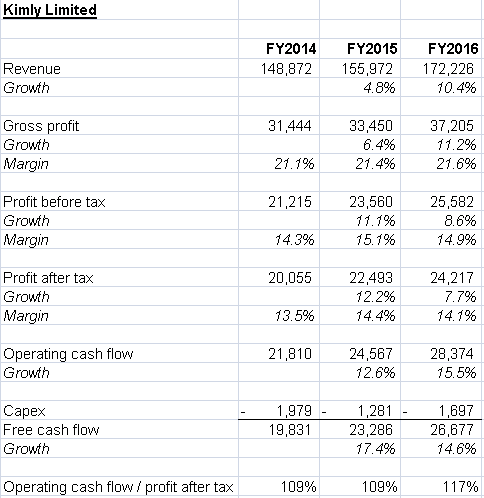 Below is a simple table I generated, noting the growth of the key revenue and profitability line items for quick reference. There really isn’t much to quibble about. While there are certainly factors that led to a boost in profits across the 3 years (eg. Lim Hee Liat’s remuneration in band D – S$750,000 to S$1,000,000 in FY2015 as compared to band B – S$250,000 to S$500,000 in FY2016) which would tell a fuller story, in general, it looks fine. One of the key things that jump out of the page is the size of Kimly’s cash position at S$29.5 million as at 30 Sep 2016. 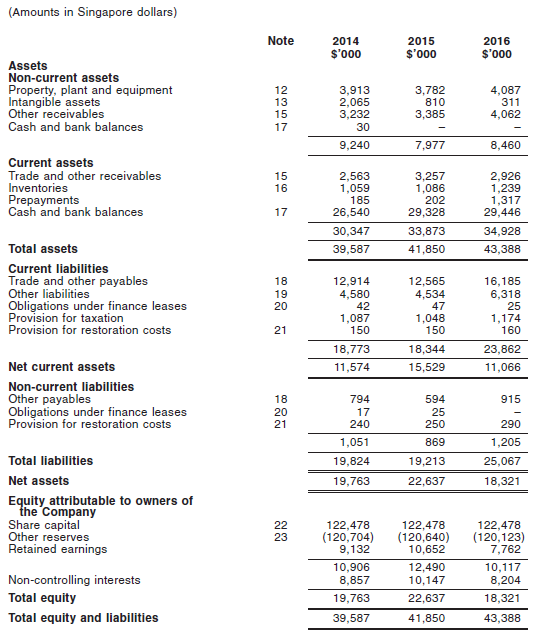 It is the largest line item (other than share capital) on the balance sheet. It also has has zero bank borrowings – all hallmarks of a cash-rich, asset-light business. Assuming there were no borrowings taken on between 31 Dec 2016 to 20 Mar 2017, Kimly’s net cash should be approximately S$74.3 million on 20 Mar 2017. The business runs on negative invested capital since cash exceeds equity for every single year and has zero bank borrowings. As such, there isn’t an ROIC to speak of. On a ROE and ROA basis, Kimly generates close to 100% and about 50% respectively for each of the 3 financial years. These are highly impressive numbers. The only concern is whether there are sufficient areas for the reinvestment of capital, which I am rather skeptical with regard to organic means. The above is a screenshot from the offer document on how Kimly intends to grow. I am skeptical that investments in technology will move the needle for them. In any case, only a small portion of the IPO proceeds were allocated for that purpose. What is interesting is that a large chunk of S$30.4 million from the IPO proceeds has been allocated for business expansion. I have doubts Kimly will be able to seriously muscle in and outbid incumbents presently leasing space from landlords. There are a couple of scenarios I can imagine Kimly utilising the firepower of what S$30.4 million can buy. The first is Kimly intending to be a landlord. While possible, it would defeat their asset-light strategy and will be pretty weird, especially since they have chosen not to inject the 17 LHL Companies-related real estate into Kimly. In any case, given the current environment, coffee shops real estate aren’t exactly the cheapest stuff on the market. As such, my opinion is that there is a low chance Kimly will pursue this path. The other strategy I can foresee if Kimly acquiring a similar but smaller operator so as to raise Kimly’s overall scale. Other acquisitions such as coffee shop cleaning services or complementary businesses that helps Kimly to scale vertically could also be possible. These appear to be the most plausible reason for the S$30.4 million in allocation. Should that be the case, assuming the deal(s) is/are done at a reasonable price, it would likely be beneficial for Kimly. I suppose we can check back in a year to see how this pans out. Going forward, Kimly will incur expenses as a listed company it did not have to bother with in the past. These will impact its financials, along with a number of non-recurring or prospective line items that will need to be adjusted. Other than the 17 new food outlets from the LHL Companies, I am assuming zero growth from Kimly’s existing businesses. Given that the market cap will be S$288.7 million and net cash will be about S$74.3 million (negligible finance leases) on 20 Mar 2017, we get an enterprise value of S$214.4 million. 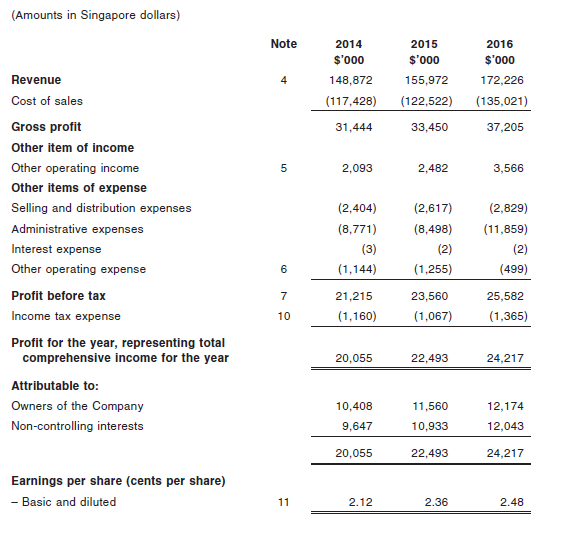 An enterprise value of S$214.4 million and normalised adjusted profit after tax of S$20.3 million gives us an EV/earnings multiple of 10.6x or a yield of 9.5%. By itself, the yield appears to be favourable. On a P/E basis, with a market cap of S$288.7 million and FY2017 adjusted earnings of S$20.3 million (EPS of 1.76 cents based on 1,154,786,732) and FY2016 earnings of S$24.2 million (EPS of 2.10 cents), we get a forward P/E of 14.2x and a historical P/E of 11.9x (not exactly representative because of expenses not incurred as an unlisted company in FY2016). There aren’t any direct listed peers in terms of coffee shops businesses listed on the Singapore Exchange (“SGX”). 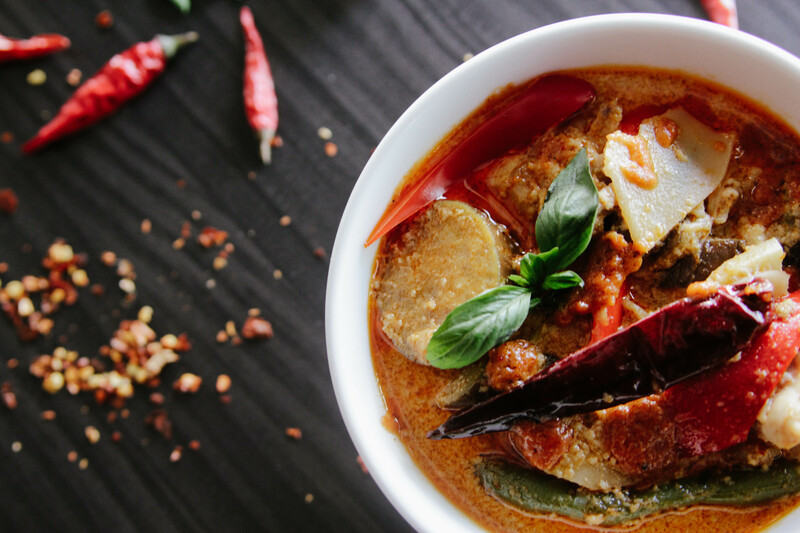 However, there are a number of SGX-listed restaurant and F&B businesses that could provide us with a reasonableness gauge of Kimly’s valuation at the IPO price of S$0.25 per share. Most of the companies on the peer list are expected to have a relatively slower pace of growth, other than Jumbo. While a large part (S$33.4 million) of the net proceeds are allocated for expansion, I can’t be certain of Kimly’s growth profile although the prevailing view of a number of people I spoke to are skeptical of its growth prospects. 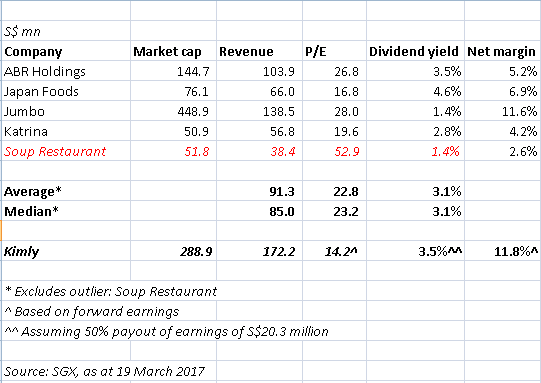 That said, Kimly has a much enviable margin and is in a more defensive sector (coffee shops and food courts) of the F&B industry compared to the rest of its peers yet is priced at the lowest valuation and will have one of the highest dividend yield. As such, I would argue that Kimly should deserve a premium above the market multiple. Assuming Kimly trades at the industry average P/E multiple of 22.8x, it would equate to a price per share of S$0.48. This represents a 47.9% margin of safety or an upside of 92.0%. For a business like Kimly’s and without even accounting for the optionality of the business utilising the IPO net proceeds to achieve further growth, I would be comfortable with a margin of safety of 10% to 15%. For simplicity’s sake, let’s take the midway of the 2 numbers – 12.5% – as the margin of safety. The price to buy would be S$0.42 and below. This is the first time I tried balloting for an IPO’s offer shares. However, it was unsuccessful, although it was hardly a surprise. With barely a million dollars worth of shares available to the public, there isn’t sufficient supply going around to fulfill the demand from public investors. Those who were fortunate to have applied and received placement shares, totaling S$42.5 million, are likely to see an immediate pop on the opening bell at 9am, 20 Mar 2017. Should the share price be below S$0.42, it could be a good opportunity to accumulate some shares of Kimly.